Criticality and reliability go hand-in-hand. Think about it: We’re told to prioritize PMs for critical assets, to build a TPM plan that accommodates critical pieces of equipment, and to perform root cause analysis on machinery that we consider to be high priority based on criticality. But how do we actually decide what makes a piece of equipment “critical”? In short, it all comes down to risk. Performing a criticality analysis allows you to understand the potential risks that could impact your business. Criticality analysis is a process by which assets are assigned a criticality rating based on their potential risk. Still sounds kind of abstract, right? How can risk be quantified? It helps to think about criticality analysis as part of a larger failure modes, effects [and criticality] analysis (FMEA/FMECA). As we’ve defined it recently, FMEA is an approach that identifies all possible ways that equipment can fail, and analyzes the effect that those failures can have on the system as a whole. FMECA takes it a step further by assessing the risk associated with each failure mode, and then prioritizing corrective action that should be taken. 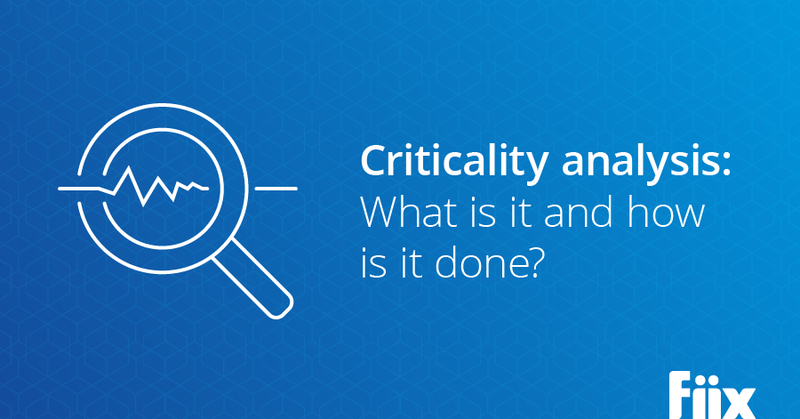 Why is criticality analysis important? As James Kovacevic of Eruditio describes, using a predetermined system to evaluate risk allows you to remove emotion from the equation. This ensures that reliability is truly approached from a risk-based point of view, rather than individual perception. Once equipment is ranked based on its criticality, work can be properly prioritized. Performing a criticality analysis also helps to clarify what can be done to reduce the risk associated with each asset. Who’s responsible for criticality analysis? So who actually carries out a criticality analysis? Industry experts posit that it should be a cross-functional effort, and we couldn’t agree more. It’s a much more effective process if input from operations, maintenance, engineering, materials management, and employee health and safety functions is considered. After all, risk can be defined differently for different teams. And since assigning risk will always be somewhat subjective, having a diverse background of knowledge to draw on will help to curb that. According to Kovacevic, there are two ways to carry out a criticality analysis. Both approaches produce a risk priority number (RPN) as a final product that allows you to rank the criticality of each asset. The first approach uses a 6×6 grid, where severity of a given consequence (on the X axis) is plotted against the probability of that consequence occurring (Y axis). Naturally, if there is a high probability that a piece of equipment will fail in a way that causes great personal injury or severe operational issues, that piece of equipment is highly critical and should be prioritized accordingly. The number at the cross section of severity and priority for any piece of equipment is that piece of equipment RPN. 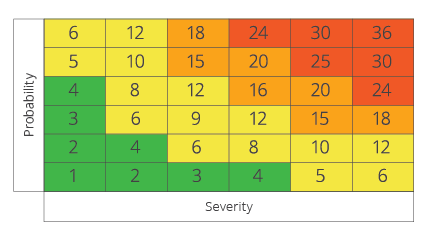 The second recommended approach is to separate the consequence categories by type (for example, health and safety, environmental, and operational). That way, you can rate how severe an equipment failure would be for each consequence category. For example, a piece of machinery that could cause severe personal injury upon failure would be a 5 or 6 in the health and safety category, but of almost no consequence to the environmental category (perhaps a 1 or 2), and moderately impactful to operations (somewhere in the middle). Once you’ve determined the severity of each consequence category for a given piece of equipment, you can multiply each of the categories together for that piece of equipment to get its RPN. Once each piece of equipment is ranked, maintenance managers can make decisions that are informed by risk, rather than gut feel. From here, all reliability-related activities and processes will run much more smoothly.